Posted on 12/22/2008 11/12/2015 Categories Giving4 Comments on Giving holiday gift cards? Give someone the power to change lives! Have you ever wondered how your salary compares with others in your profession? Do you want to know if it’s better to prepay your mortgage or to invest instead? Are you confused about how to accelerate your debt payoff? Curious what it will take to save your first million dollars? Today is your lucky day! It doesn’t matter if you flunked math class; you won’t need a graphing calculator, abacus or legal pad. You don’t even need to count your fingers and toes. Simply click on your financial question, enter your numbers, and receive an accurate answer, fast! I’ve compiled a comprehensive collection — organized by category — of 110 personal finance calculators and helpful tools. They’re free, found online and designed to help you find fast answers to your financial questions. As they say, knowledge is power so please share this resource page with others and bookmark it to keep it handy! What is the true cost of car ownership? This calculator reveals the hidden costs — depreciation, interest on your loan, taxes, fees, insurance premiums, fuel costs, maintenance and repairs — associated with buying, owning and operating a car over a five-year-period. Your next car, new or used: Which is right for you? The average used car costs less than half the average new car. It’s no surprise that used cars outsell new cars 3-to-1. Should I lease or buy my car? Calculate your monthly payments and your total net cost. By comparing, you can determine which is the better value for you. Calculate your payment and more. Should I get a auto loan or a home equity loan? Two good reasons to take a look at home equity loans to finance your automobile purchase: Home equity loans often have lower interest rates than auto loans and the interest may be tax deductible. Will driving to a cheaper gas station save me money? How much would my budget reductions be worth if I were to invest them? Contributions to a retirement plan, participation in a company-sponsored flexible spending account, change in filing status, or number of allowances claimed could have a direct impact on take-home pay. Use this calculator to help compare your current situation to what-if scenarios. Evaluate your personal income and expenses and see if you are running in the red or the black each month. If I move, how much income will I need to maintain my current standard of living? Use this cost of living comparison calculator to compare the cost of living between U.S. cities. The information is updated quarterly. How does my budget compare to others? Compiled with information from the Bureau of Labor Statistics, this worksheet tells you how much you’re spending relative to people in the same income bracket. See where your money is being spent and how much you have left to save. 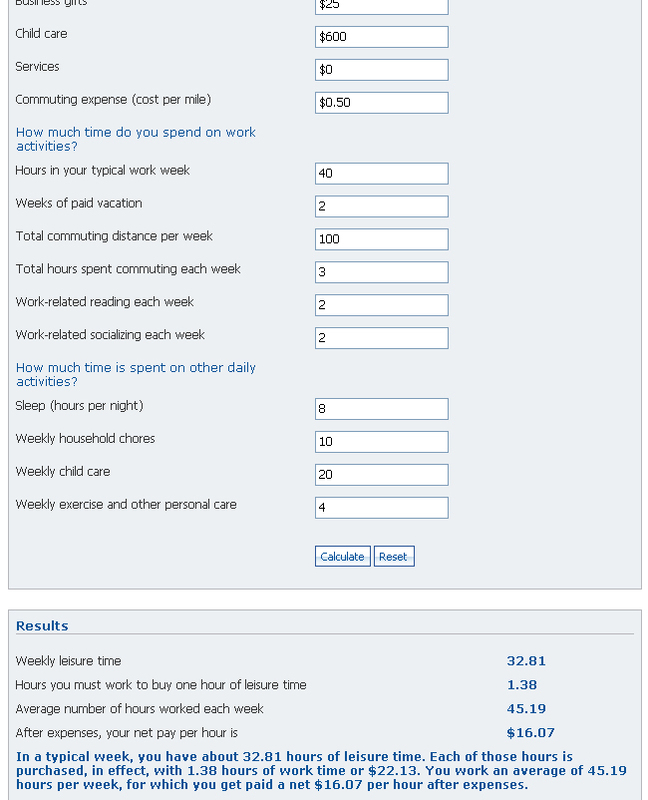 Compare your expenditures to targets, which can help identify areas for improvement. Are two paychecks worth it? Child-care costs, transportation, work clothes and take-out meals all add up. See what makes sense for you and your family. Children are worth their weight in gold — that is, when you add up all the costs. Use this calculator to figure out Junior’s bottom line. How much allowance might I pay my child? Find out what your childhood allowance is worth in today’s dollars. Or compute what your kid’s allowance would be worth in any year back to 1913. How many and what price must I sell my product at to make a profit? This Business Valuation Calculator creates a possible market valuation for your business and determines how much your future cash flow is worth today. Should I lease or buy my business equipment? The Equipment Buy vs. Lease Calculator evaluates monthly payments and your total net cost. By comparing these amounts, you can determine which is the better value for you. What is my operating profit percentage? Operating profit is what’s left from your sales dollar after you’ve deducted your cost of goods sold and your ordinary operating costs. Your operating profit percentage tells you the percentage of your sales that turn into profit. Buying a house or duplex to rent isn’t at all like investing in stocks or mutual funds. This is hands-on work that starts with finding a property capable of generating enough rental income to make the transaction pay off. See if the numbers work. What is the maximum self-employed retirement plan contribution I can make? Determine your maximum contribution amount for a Self-Employed 401(k), SIMPLE IRA and SEP based on the assumptions you input. What will it take to save for my child’s college education? Higher education carries a high price tag. If you want to send your child to college, now is the time to start saving. How do I calculate my budget as a full-time student? This calculator is specifically designed to help students understand their expenses and income while attending a university, college or other full-time educational institution. It allows you to input your expenses and income for an eight-month school year. How much financial aid can I expect for college? If finances are tight, chances are you’re going to have to rely on some combination of savings, financial aid and student loans. How do I choose and evaluate my 529 College Savings Plan? The question isn’t should you invest in a 529 College Savings Plan, but rather, which one? A graduate degree can be the ticket to a better career or the stepping stone to advancement in your current job. 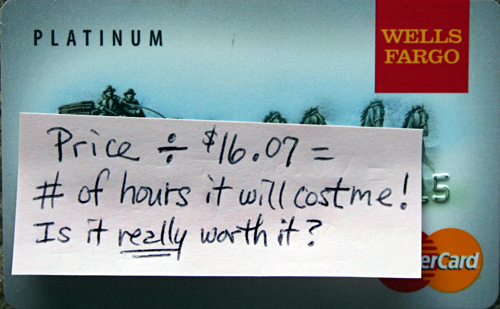 But by the time you factor in lost income and the inevitable student loans, is it really worth it? Weigh the actual costs versus the fiscal benefits. This calculator takes into effect any increase in expected earnings after you graduate, your estimated education expenses, and any lost earnings during the time you are in school. How does class work? Where do I fit in? Four commonly used criteria for evaluating a person’s position in society (class) are education, income, occupation and wealth. This interactive graphic tool allows you to access your social class and examines how economic mobility has changed in recent decades. How does my salary compare with others in my profession? A free basic report shows national average salaries adjusted by location. How does my income stack up? What portion of the tax burden do I pay? Find out how your income stacks up against your fellow citizens. How does my net worth compare with others? See where you rank based on your age and income. How does my savings compare with the national average? See how much you will have accumulated when you reach age 65 and the national average of 401(k) savings in your age group. The Debt Consolidation Calculator is designed to help determine if debt consolidation is right for you. How can I accelerate my debt payoff? Consolidating your debt is only half of the battle. You still need a plan to get your debt paid off. How do I roll-down my credit card debt? The Credit Card Roll-down Calculator applies two simple principles to paying off your credit card debt: 1) Payoff your highest interest rate first; 2) When a card balance is paid in full, apply its monthly payment to the card with the next highest interest rate. See how these principles can be applied to your debt to become debt-free. Is my debt load too high for my income? Am I in financial trouble? Find out how much you’re paying each month and whether your ratio of debt to income puts you at risk. The ideal spender saves money off the top, covers basic needs, stays out of debt, gives generously to charity and gets real pleasure from planned, prudent purchases. The Savvy Spending Quiz is designed to get you thinking about how you spend money and, perhaps, to bring you closer to the ideal. See your potential credit score range by answering this credit survey. What is my estimated range of FICO scores? Answer these ten easy questions and they’ll give you a free estimated range for your three FICO® scores. How do I find a credit card deal based on the criteria I care about most? Try the Credit Card Analyzer. Which is better for me: rebate card or low rate card? How might a consolidated loan increase my investment balance? Getting a consolidation loan can do more than payoff your debt. Use this Consolidation Loan Investment Calculator to see the results of paying off your debt and investing your payment savings. How long will it take to pay off my credit cards if I only make the minimum payments? Use the Credit Card Minimum Payment Calculator to calculate your debt pay off date. Should I prepare my own will? This quiz will help you assess your estate planning knowledge so you will have an idea of how much help you need to make sure what actually happens at your death is what you want to happen. Your life expectancy is influenced by a number of factors including family history and your personal lifestyle. What is my estimated estate tax liability? Estimate your estate tax liability and project the value of your estate, and the associated estate tax, for the next ten years. What goal is most important to me? The Prioritizer helps you rank a series of goals or options which are most attractive to you. Find out when you’ll reach your goal. What will it take to save one million dollars? Should I prepay my mortgage? Or should I invest instead? Compare what would happen if you took one of two choices with some extra cash you have — prepaying your mortgage each month, or investing it instead. How much home equity will I have? Estimate your current and future home equity by subtracting the balance on your mortgage from the projected value of your home. Am I paying too much for rent? Am I charging too little for rent? Your rent is compared to comparable rental listings by proximity. What type of mortgage loan is best for me? Compare mortgage payments and other monthly costs for different mortgage loan types. Get an estimate of the potential tax credit if you itemize and deduct interest on the loan. Which mortgage loan is the best value? Use this Loan Comparison Calculator to sort through the monthly payments, fees and other costs associated with getting a new loan. By comparing these important variables side by side, this calculator can help you pick the loan that works best for you. How do I generate an amortization schedule for my current mortgage? The Mortgage Loan Calculator calculates your monthly mortgage principal, interest, taxes and insurance payment (PITI) and amortization schedule. What happens when my adjustable rate mortgage adjusts? This calculator will help you find your new payment. Determine when you would break-even with a mortgage refinance. You may decide to “buy down the interest rate” by paying extra money up front in the form of discount points. Determine if this might make sense for you. What is my home’s rate of return? Purchase price, loan terms, appreciation rate, taxes, expenses and other factors are considerations when evaluating a real estate investment. Determine your potential IRR (internal rate of return) on a property. Do I have the right kind of insurance? The Insurance Planner evaluates you and your auto, home, health, life and career to make a personalized assessment of your insurance needs. Try the Life Insurance Needs Estimator to find out. What are my disability insurance needs? One of the most common causes of income loss is through a disability. While most disabilities cause only temporary loss of income, any income loss can be devastating if you are not financially prepared. How Much Risk Can I Handle? This quiz gets you thinking about your attitude toward, and capacity for, risk. It suggests typical investment portfolios based on your answers. How should I mix stocks, bonds and cash in my investment portfolio? The Asset Allocator is designed to help you create a balanced portfolio of investments using your age, ability to tolerate risk, and several other factors. How much will my investment return? Meeting your long-term investment goal is dependent on your investment capital, rate of return, inflation, taxes and your time horizon. Sort through these factors to determine your bottom line. What was the Compound Annual Growth Rate (Annualized Return) of the S&P 500 over various time spans? This calculator lets you find the annualized growth rate of the S&P 500 over the date range you specify; you’ll find that the CAGR is usually about a percent or two less than the simple average. How can different investment fees impact my investment strategy? Even a small difference in the fees you are pay on your investments can add up over time. What will it take to reach my investment goal? Determine how much your investment might grow before taxes, after taxes, and after taxes and inflation. It also provides suggestions on what to change if your plan doesn’t look like it will meet your investment goal. How might I use debt to magnify my investment returns? This Investment Loan calculator helps illustrate the effect of using a loan to purchase an investment or appreciable asset. Using debt as leverage to purchase investments can magnify your return. The downside is that you also increase your risk. For example, if your investment were to lose all of its value you would not only have lost your investment but you would still owe the balance on the loan. How do I estimate the tax-equivalent yield for a municipal bond? Income generated from municipal bond coupon payments are not subject to Federal income tax. In addition, if the bond was issued in your state of residence, you can also avoid state income taxes. Use this Municipal Bond Tax Equivalent Yield calculator to determine the yield required by a fully taxable bond to earn the same after tax income as a municipal bond. How do taxes affect investments? This Taxable vs. Tax Advantaged Investments calculator is designed to help compare a normal taxable investment, a tax deferred investment and tax-free investment. Should I invest? Or should I prepay my mortgage instead? This calculator allows you to compare what would happen if you took one of two choices with some extra cash you have — prepaying your mortgage each month, or investing it instead. Which online broker is best for me? How do you choose an online broker? The answer comes down to your priorities and what type of investor you are. Use this Loan Prequalification Calculator as your first step in determining your ability to qualify for a loan. This simple tool calculates a mortgage, car loan, or any other simple interest amortization over a fixed time with fixed monthly payments. Your net worth is the value of all of your assets, minus the total of all of your liabilities. This calculator helps you determine your net worth and estimates how your net worth could change over the next ten years. According to The Millionaire Next Door, how wealthy am I? In the book titled The Millionaire Next Door by Thomas J. Stanley and William D. Danko, there is an interesting wealth calculation. See where you stand. How much will it take to create a secure retirement? Use this Retirement Nestegg Calculator to help determine what size your retirement nest-egg should be. How much should I plan to save for retirement? The charts and calculations will change as you go along, so try a few different numbers and see how different scenarios might play out for you. Should I convert my regular IRA into a Roth IRA? Which type of IRA is the best choice for me? How much annual income might I have at retirement? How much retirement income will my savings produce? Annual savings, expected rate of return and current age impact monthly income during retirement. Will you have enough? Do I know enough to plan my retirement? Take this quiz to determine if you’re ready to tackle the task of planning your own retirement. How might my expenses change after retirement? The retirement expenses calculator will help you determine how your annual living expenses are likely to change after retirement. How much might I receive in Social Security? Determine which accounts you should withdraw from first for income needed during your retirement. 401(k): Should I spend it or save it? Depending on your age and tax bracket, making the wrong decision can cost you thousands of dollars both in taxes and lost earnings. This calculator helps illustrate the difference. How much money should I stash for emergencies? Having adequate emergency savings can make unforeseen unemployment, auto repairs, medical emergencies, property damage and legal issues more manageable. How much can I save by packing my lunch instead of dining out? How much would postponing my savings plan cost me? Waiting to begin your savings plan can have a huge impact on your results. A delay of even a few years could cost you thousands of dollars. Most people value their work time in relation to their gross pay, but several expenses should be subtracted. You’ll need some basic information about your spending habits to complete this worksheet. This basic financial calculator works just like a pocket financial calculator. In addition to the normal calculator arithmetic it can also calculate present value, future value, payments or number or periods.